Now that we are a few weeks into spring practice, there hasn't been much talk of a quarterback controversy and if you were to ask G.A. Mangus or Steve Spurrier they would simply differ the question and say we have two capable quarterbacks who can both make plays and both will most likely see quality playing time during the 2013-14 football season. If you were to ask me on the other hand I would have a completely different reaction. I would say that we definitely have QB controversy or a battle for the starting job in place. I would be lying if I said I wasn’t looking forward to a battle during the spring from our top two QB’s. Unfortunately Shaw has been sidelined after having surgery on his foot and this battle will not take place during spring workouts, it will have to wait until fall practice is underway, but for some of us this competition began a long time ago. Yes, they are both capable of making plays and offer different styles of playing the position, but as a fan I have to sit back and really think about who gives us the best shot of winning and fulfilling our dreams of finally capturing that elusive SEC title and a shot to play on one of the biggest stages in sports, the BSC National Championship game? For most fans the decision is easy, let’s go with experience and comfort, let’s go with what we think is safe, let’s go with 17-3. For me, it’s not so easy, I want to see the best quarterback play, the one who can lead us to the promise land and forever change the way America views Gamecock football and from what I have seen in the past year I believe Dylan Thompson is the man for the job. I know, I know, many of you are gasping for air right now and cannot believe what you are reading and some of you may be saying, yes, finally someone sees what I see. Well if you are the latter, then I do see what you see. I see a young man who has the potential to be great, I see someone who is not afraid to take chances and I see someone who will lead his team and is willing to do whatever it takes to get the job done. I see someone who will only blame himself for the mistakes he makes on the field and someone that will be the last one to point fingers. Thompson has shown the ability to perform on big stages in hostile environments and remains poised in the pocket while under direst. In two starts Dylan Thompson has thrown for a combined 640 yards, while completing 44 of 78 passes and tossing 6 TD passes and 1 interception. The mind blowing stat for me would have to be attempting 78 passes in just two starts, that’s an average of 39 attempts per start. 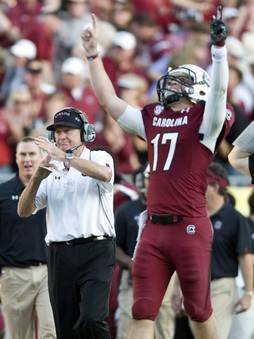 The most attempts Connor Shaw had in the 2012 season was 34 in a loss against LSU, in which he completed 19 passes for 177 yards while tossing two TD’s and two picks. Shaw also rushed 12 times for minus 1 yard in this game as well. There is an obvious change in flow to the game when Thompson is on the field; the offense seems to just “Click” and there is no denying the offensive plays are more directed toward the passing game. I understand Shaw is a threat on the ground and can make plays with his feet, but at times it seems that is all he relies on. I feel Thompson is underrated as an athlete, as he can also make plays with his feet if need be and escape the pocket. The difference would be Thompson keeps his eyes down field and looks for the open receiver before leaving the pocket, whereas it appears Shaw makes one or two reads if nothing is there he pulls it down and takes off. While this is effective at times and not so much at others. In the last six games Shaw averaged 2.4 yards on the ground with 67 carries and a big chunk of his yards over this period of time came against Michigan where he rushed for 96 yards and had a 64 yard scamper. Shaw’s ineffectiveness on the ground over the last few games of the season may be due to his foot injury, but looking at the beginning of the season Shaw averaged about 3.5 yards a carry. As a fan I would rather see the running back average 3.5 yards a carry instead of the quarterback trying to make things happen and risking injury and getting beat up. Shaw and Thompson both have their own style of playing and it is up to the coaching staff to decide which QB gives us the best chance to win. Spurrier has said in the past that Shaw is not as effective when unable to run the ball, reading between the lines, he believes Thompson is a better passer(in my opinion). Thompson can make all the throws and is able to stretch the field with his more than accurate deep ball; he looks off the defenders and runs through his progressions. If Thompson gets the nod out of fall camp I wouldn’t be surprised at all. I would also not be surprised if he makes a few mistakes along the way considering that he doesn’t have to experience Shaw has, but we all know there is only one way to gain experience and with Thompson having this year and the next before graduating, why not let him gain as much experience as possible heading into the 2014 season? I am not against a two quarterback system at all, but I do think Shaw should be the one coming off the bench. He could make huge contributions with his running ability on 3rd and short or goal line situations. Ultimately I have no say in what happens as none of us do. We just have to trust the coaches and let them make the decision they feel is right. I am a Gamecock till death and will support whoever is under center or on the field at all for that matter, but as fans we have opinions and at times feel that they should be heard.